Massage is an ancient art used for relaxation as well as for giving tone to the muscles, increasing blood circulation and for treating various diseases. However, Ayurvedic massage has its speciality as it is done according to age, constitution, season, condition of agni and ama. Taking into consideration these factors, one should select proper oil or other substances. If the massage is done, by selecting proper method, it becomes useful not only for promoting health and achieving longevity but becomes excellent tool for treating various diseases as well. This is the first book in massage which deals with various aspects from history, basic principles, anatomy and physiology along with various techniques that are required for massage. The book also deals with special chapter on Marma Massage which is kept secret for years together. The readers will also find the chapters on massage for specific diseases and the one on research very interesting. We have also included more than 90 illustration to simplify all the strokes and methods used for massage. Dr. Subhash Ranade was formerly Principal of Ashtang Ayurveda College, Pune, India and is the author of more than 92 books on Ayurveda, which have been published in German, Polish, Italian, English and many Indian Languages. He has the honour of being visiting Professor to all the colleges of Ayurveda in USA and other institutes like Sewa Akademie in Germany, Ateneo Veda Vyasa in Italy, Foundation of Health in Poland and Ayurveda International Diffusing Association of Japan. Since 1981, he has visited and has conducted hundreds of Ayurveda courses for medical practitioners in Europe, U.S.A. and Japan. Dr. Rajan S. Ravat, B.A.M.S., D.N.T.Y.M., is Lecturer at Ashtang Ayurveda College, Pune. He is also the Member and visiting Lecturer of International Academy of Ayurveda, Pune. He has been regularly visiting institutes like Foundation for Health Promotion, Poland, Ateneo Veda Vyasa, Italy and SKA Ayurveda, Italy for the propagation and promotion of Ayurveda. He has to his credit many teaching courses on Ayurveda and Yoga conducted in India and abroad and has also contributed for the first CDROM on Ayurvedic Massage and Marma Therapy. Massage is an ancient Indian art used for healing, relaxation as well as for treating various diseases. Touch can bring about dramatic changes in body and mind. Ayurvedic massage has many advantages over any other oriental or modern systems of massage. 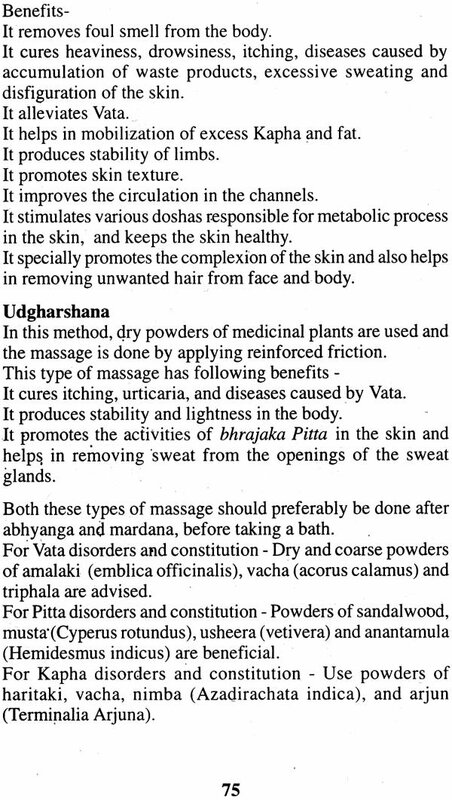 Ayurvedic massage is done according to constitution, age, stage of the disease, aggravated doshas, status of agni and ama. With this subtle understanding Ayurvedic masseur can choose correct type of oil or other substances for massage, that can bring dramatic results for healthy as well as for diseased person. Inspite of development of sophisticated equipment for treating various physical injuries and wide range of electrical apperatus it is quite surprising that after understanding fundamental principles of Ayurveda, if correct oil or other substances and methods are used, they give much better results. 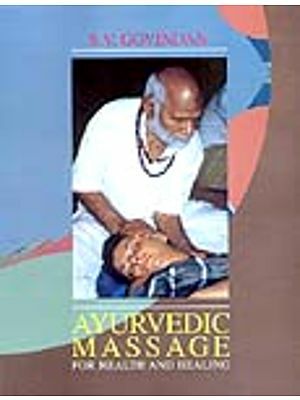 Many authors have written about Ayurvedic massage. However very few have given proper consideration to the basic principles of Ayurveda. Therefore while writing this book we have explained all fundamental principles of Ayurveda in the first five chapters. Later on we have explained various methods well as oils and other substances used for massage. For the first time, we have explained very important concept ‘Marma massage` which is becoming very popular not only. The chapter on ‘Massage for specific Diseases` will no doubt attract attention of the readers. As it has highlighted some important diseases in which massage can be very useful. We have given more than 90 illustrations for explaining various basic principles and methods of massage. This addition will make the book more readable and useful to the people. We hope that this book will receive good response from Ayurvedic as well as other scientific community. Authors are thankful to Dr. Hans H. Rhyner, Dr. Prasanna Paranj ape, and Dr. Ajit Mandalecha and for providing valuable material and helpful suggestions.